A Flomaton teen was severely burned in a lawn mower fire Thursday. The 15-year old was transported by ambulance to D.W. McMillan Hospital in Brewton after the noon accident. He was later transferred to the University of South Alabama Regional Burn Center. The Flomaton Fire Department, Engine 519 from the Century Station of Escambia Fire Rescue, Escambia County EMS and the Flomaton Police Department responded to the call. 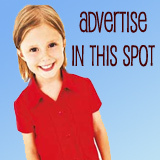 Submitted photo by Christine Stanton for NorthEscambia.com, click to enlarge. We’d appreciate them when they are. I am Ryan’s dad’s cousin. Just wanted to let you know that my family, friends, and church are praying for you! I’ve read all the comments and there is no blame other than maybe the manufactor. Good luck Ryan. Best wishes to you Ryan for a speedy recovery! First, I want to thank the ones that are concerned about Ryans recovery. If you know Ryan, you know that he loves to help out in anyway that he can. He happened to be helping his pa out that day by cutting grass. This was a freak accident and for those that dont know and comment on things before you find out the facts, the lawnmower had just gotten out of the shop the day before this accident. I really don’t think anything could have been done to prevent this from happening, that is why they are called accidents. Ryan is my first cousin and we love him dearly. He is a strong young man and will make it through this. Please dont use this site as a way of putting the blame on someone or something , please use it as a source to send prayers and concern to the family. God Bless and Keep him! MY 13 YR OLD DTR MOWED OUR LAWN FOR THE FIRST TIME LAST WEEK AND I WAS A NERVOUS WRECK WORRYING ABOUT HER ON IT……PRAYERS ARE WITH THIS YOUNG MAN AND HIS FAMILY. GOD WILL TAKE CARE OF HIS CHILDREN, I WILL BE PRAYING FOR A SPEEDE RECOVERY. GOD BLESS YOU. Thoughts and prayers for the teen and family. Our prayers are with this family . Lean on God and He will comfort you all. My prayers goes out to this family. My 11 year old was mowing my grass on our riding mow yesterday and God knows I just didnt think something like this could happen. This is a close friend of our son’s. He is a very mature, respectful young man who is always thinking of others. Praying for God’s hands of strength, healing and comfort to surround him (and his family). I hope everything truns out ok.n not jus 15 yr/old sons cut grass I a 16yr/old daughter cut grass w/ a zero turn.thank God he was not sittin on it when it blew up!my prayers go out to him n his family!and I hope he has a very speedy recovery!God bless him! What horrible news. My best wishes and a speedy recovery. holy cow! Prayers for quick and complete healing. That being said, don’t be defensive about folks wanting to know what caused this. It’s important when something like this happens because if it’s due to faulty manufacturing those of us who let our 15 y/old sons mow our grass on these things might want to investigate our mowers (not to mention this family would have a huge lawsuit against the manufacturer and perhaps a recall would be in order). If it’s due to operator error of some sort, that’s important info to know how to avoid as well. We have a Toro zero turn and this story and photo give me pause. The gas tank in directly under the seat and back of the legs. Good advice about preventative maintenance, I know we’ll be more careful in the future. God bless this young man! This is our grandson and he is a very kind and thoughtful person. He is especially considerate of older people in his life. This was an unfortunate accident and no one could have forseen it happening. Thank you for all of the prayers and wel wishes. Please don’t speculate on how it happened because it was no one’s fault. We love you R!! It looks like a ‘zero turn’ mower that was designed with the engine under the seat, not a good idea. Just another reason why I prefer the traditional tractor style mowers, I like the engine in front where I can see it. My prayers for healing and strength to get through the days ahead go out to this young man and his family. Stay strong and the Lord will get ya’ll through this. Just a note to all that are reading this story and comments. When we were going through my husband’s riding mower this spring checking things out for grass cutting this summer, we found that the gas hose in the engine had dry rotted from sitting up over the harsh winter we had. It had cracks all in it which meant that if we hadn’t of replaced it, the same thing possibly could’ve happened to my husband also. Preventative maintenance can go a long way for one’s safety so please never assume things are good to go without checking it out. These things have big gas tanks, and they do get hot. Not saying what happened, and not knowing what happened one can only guess. I hope and pray for the best for the young man, and like others have stated would really like to know what happened. Gas is scary and I’ve seen firsthand what one can… can do. 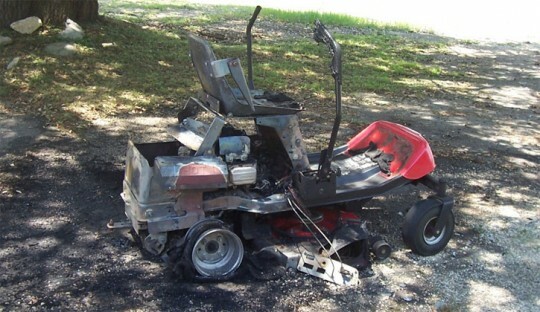 geeze….yesterday, when i spilled gas while filling the riding lawn mower, i paused and thought, “i hope this thing doesnt ignite when i start up”…. (i think ill wipe it off next time it happens)…maybe, someone, of expertise, could take this opportunity to provide some good safety tips to avoid these kinds of accidents….im wondering if there will be a fire investigation done, to see exactly why this happened….but, he couldnt be in a better place to recieve extensive burn care.. (use to work in a burn unit)…God blessings be with him. Prayers are with you Ryan and also your family. This is my nephew and I know his family appreciates all the prayers being sent his way. We love you R! Get better soon! My husband and I was in the ER.. when he came in, our prayers goes out to this family..
Any number of things could start a fire on a lawnmower like this. A shorted battery cable, other wiring short, or gasoline leaking on a hot engine are but just a few possible causes. Prayers to this young man and his family. is going to be ok. I saw this today, it was under a tree before you cross the bridge into florida from flomaton. Prayers to him and his family!